Airsoft Guns » Choose Your Mission » C.Q.B. The Heckler & Koch MP5SD6 is synonymous with special forces. This sound-suppressed version of the classic MP5 has been used around the world by military, law enforcement and anti-terrorism units. 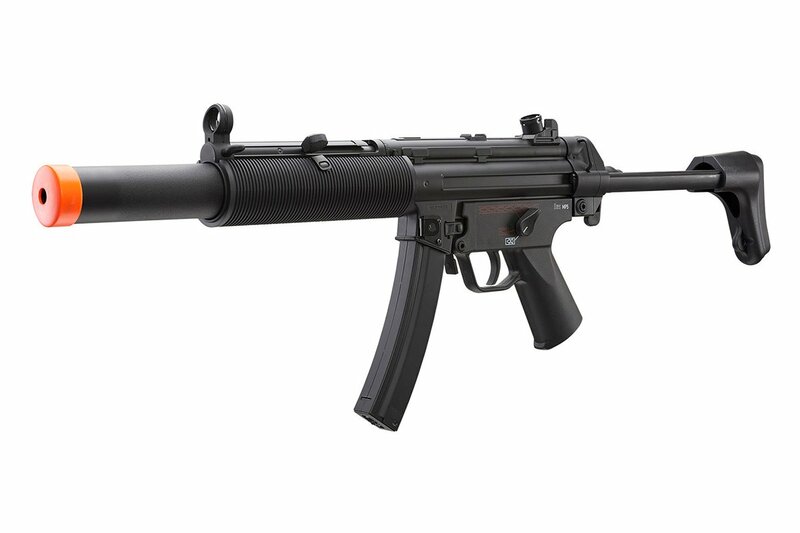 Whether you want to be just like Charlie Sheen in "Navy Seals" or replicate an awesome loadout from your favorite video game, this MP5 AEG airsoft gun from Elite Force is sure to get you there! This gun is from Elite Force's Competition line, which means it's budget-friendly but performance-focused! The H&K MP5 SD6 airsoft submachine gun is all business from the tip of its mock suppressor to the end of its retractable stock. The adjustable length and hop-up unit mean it's ready to rock both close quarters and long-range play! It has an injection-molded lightweight polymer receiver and a metal outer barrel, which stay strong even as you're maneuvering tight quarters. The version 2 gearbox, reinforced gears and long-type motor are full metal as well. Both lefties and righties can use the best MP5 airsoft CQB SMG in its class thanks to an ambidextrous selector switch. The top-end muzzle velocity of 330 FPS is excellent for close range shots and adequate for longer distances, especially in regions where there are restrictions. Two included high capacity magazines mean you have enough ammo to last you on the field as well. This gun comes ready to be wired to the front, but it can easily be swapped to the rear if you want to switch the stock and create a different style of MP5 for yourself later. Kick that boring M4 model to the curb and try something different with the fully licensed Elite Force H&K Competition MP5 SD6! The gun looks great, itÂ’s my first airsoft gun so IÂ’d say you can take my review with a grain of salt, but I think itÂ’s amazing. It feels solid, and shoots well. So far I have encountered only one real problem which is the charging handle. It is only for looks, but I liked to use it anyways. A couple days after something happened and now I canÂ’t pull it back fast like I could at first, I have to slowly pull it back to use it. Because itÂ’s not used for anything important, itÂ’s not much of a problem anyways and it was honestly probably an issue of mismanagement more than anything. Will an I Power 7.4v 1100mAh 2s 20c LiPO Butterly Battery work in this gun? The battery has two sections basically. But can those both fit in the gun? It may be a little tight due to the wiring, but it should. So the receiver is actually polymer. The only metal on this is the stock adjustment, the mag, and the rear sight. what battery would work best with this? can it take a 7.4v Lipo battery? Is it just me or does this look like the silenced smg from Fortnite Battle Royale? that's because it is the same gun.